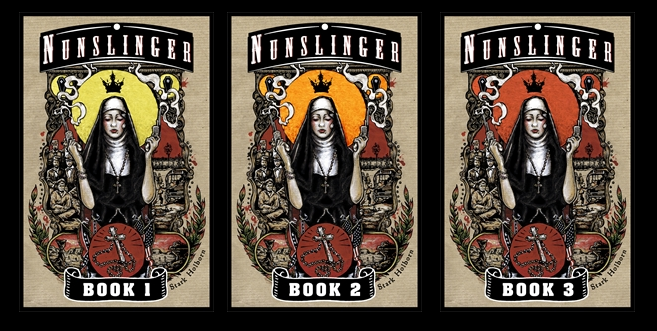 Hell, y’all better be as jumpy as a pail of cats in a shrimp hurricane: NUNSLINGER Books 1-3 have been loosed from their pens to rampage ‘cross the plains of e-book retailers. First, I gotta say a sizeable thank you to those folks at Hodderscape for all their hard grafting. They’ve been working their fingers off to get these critters live and prowlin’, so y’all can take all three home for your very own. Ain’t that fine? They’re grazing on Amazon, Google Play, iBooks, or wherever y’all normally corral your e publications from. And if you can’t wait for the next installments, well then, better go look up Books 4 – 6, which’ll be crashin’ through the window on 13th March 2014. Here’s to a rip-roaring, pistol-toting New Year, one ‘an all. Posted in Nunslinger.Tagged Nunslinger, release.